A few weeks back I posted about a Nook Touch hack that enabled a partial refresh mode. 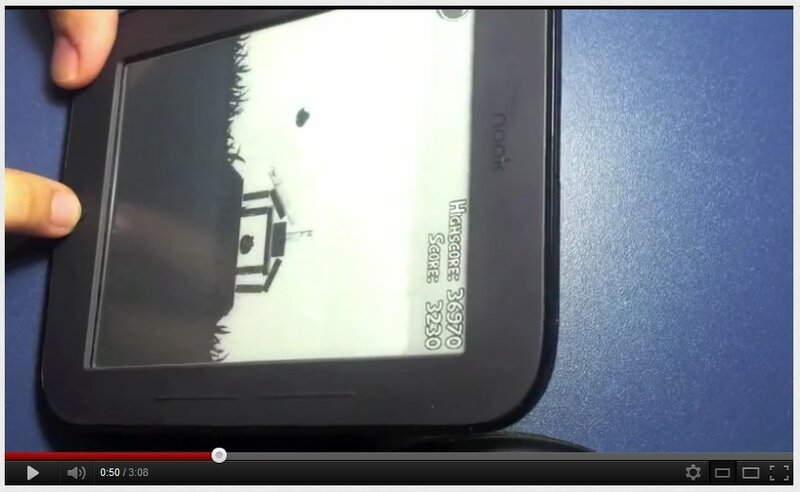 As you could see in the demo video, the refresh rate was almost fast enough that it could he used as a tablet. The work on the hack never stopped, and yesterday someone posted a new demo video. The hack can now change the contrast of the E-ink screen, ie it can make the screen seem whiter or darker. That's worth more than you might think, but you might have to be using an E-ink device as a tablet to see the value. One thing I've noticed on my Sony Reader Wifi is that some apps, particularly ones with dark color schemes, don't look good on the screen. This hack fixes that issue for the Nook Touch (I really need to try it on the Sony Reader Wifi). Attention B&N Folks: Do you want to know something that's funny about this? I was at the Nook Tablet launch, and I distinctly recall your boss saying that there was no value in making the Nook Touch be more than an ereader. I'd say that the video above proves him wrong. B&N is sooooo missing the boat on this. Really, if Kobo ever decides to make the KoTouch Andy-based — as the Vox is — and do it in a way that makes it a *tablet*, they could steal the hell out of B&N Nook Touch potential customers. Hell, some current NoTo owners might dump their devices to avoid the re-rooting problems that Updates bring. Add on bluetooth or audio and a mic and it would be great for Skype or sip calls. I’m in an on-line seminar discussing a classic. It would certainly be convenient to have everything I need for the seminar all in one. I tried rooting my Nook Touch and didn’t get anywhere (I might be a little bit stupid). I would absolutely pay for a device that could do something like this – I stare at screens all day and any chance I have to read on e-ink I’ll take. I’d happily fork extra money over to B&N for a Nook that could do what’s demonstrated in the video – I”m pretty sure I’d trade in my Kindle Fire for it. Any word on what this does to the battery life?